ORLANDO, Fla. – Like any couple, they’ve had their fair share of ups and downs. They’ve feuded publicly and fought privately. They separated for a year and reunited with an understanding that it was best for both of their careers. They’ve grown older together. 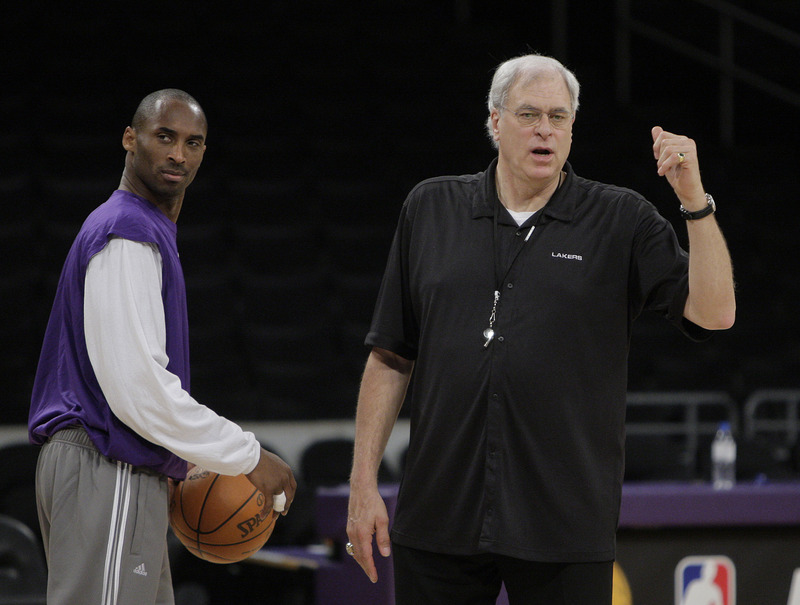 Kobe Bryant and Phil Jackson have endured. Bonded by basketball, the superstar and his contemplative coach are on the cusp of another NBA title. For Jackson, No. 10 – and one for the record books. Today the Los Angeles Lakers, seeking their 15th championship and first since 2002, will try to put away the Orlando Magic in Game 5 of an NBA Finals in which every game but the opener has been decided by one or two key plays in the closing seconds. After a day to decompress following L.A.’s 99-91 overtime win in Game 4, both teams practiced Saturday at Amway Arena, which because of the 2-3-2 format will be hosting its final game of the season. The Magic, who have been written off several times in these playoffs, have faith that they can become the first team in finals history to overcome a 3-1 deficit. The Lakers understand what’s at hand. They don’t want to give life to an Orlando team that has come back before. One year after losing in the finals to Boston, Bryant and his teammates want to finish the job. This is the chance Bryant has longed for, the opportunity to silence those who feel he needs a fourth title to validate his legacy. He and the Lakers have not won it all since Shaquille O’Neal left in 2004, shortly after The Big Diesel chugged off in a trade to Miami. Bryant swears the he-can’t-win-one-without-Shaq argument hasn’t bothered him. That’s hard to believe. The three straight championships from 2000-02 came so easily. It seemed as though it would take no time for him to win Nos. 4, 5, 6. But it’s been a long time since the last one. A devout student of the game, Bryant knows that championships are what divide the very goods from the greats. Bill Russell won 11 rings. Michael Jordan six. On Saturday, he was asked if Jordan’s mark was a number he would like to chase. “I’m trying to get this damn fourth one,” Bryant said, laughing. A rare smile. Throughout much of the series, he has worn a scowl. His kids nicknamed him Grumpy after one of the Seven Dwarfs. He’s turning into Happy. On the brink of returning to the top, Bryant seems more at ease, confident. He has an appreciation for the journey to each of his three titles. Bryant knows the road well, and he can finally see its end. While Bryant embraces the possibility of completing his quest, Jackson is leery of looking too far ahead. That’s asking for trouble. If the Lakers win, the 64-year-old Jackson will surpass Red Auerbach for the most titles in history. It’s a distinction that almost seems to bother Jackson, who won six in Chicago with Jordan and Scottie Pippen running his triangle offense before he took over the Lakers in 1999. Even considering the achievement makes him squirm in his flip-flops. Two handfuls of rings is not something the son of a preacher from North Dakota who became a valued role player on two championship teams in New York in the 1970s could have imagined. His second gift was inheriting the O’Neal-Bryant package. But after winning three straight titles, the Lakers’ family became dysfunctional. Success splintered the team. Bryant craved the ball. But O’Neal got it, and more often than not, Jackson sided with his big man. But time has healed all the surface wounds and Bryant and Jackson now share a bond built on respect and a common drive to excel. While they may not outwardly show it, Bryant and his coach are tighter than ever. “The second time around it became more of a personal relationship, us having been around each other and then having this new group of guys that we both had to lead,” Bryant said. Bryant called Jackson’s potential trump of Auerbach “phenomenal” and scoffed at the idea he has won only because of talent. As for the possibility of playing for anyone but Jackson, who has not outlined his plans beyond this season, Bryant can’t consider it.